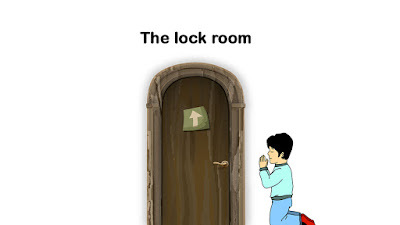 One Line :-This story revolve round the lock room . A traaveller reached a town late public house the night. it was raining heavily the night was stormy.he went to the nearest in for sheller. The door of the public house was locked from inside.he knocked at it many times.the public house keeper said.
" I am sorry.......... the key is lost..........only a black key can open the door"
The traveller understood what the public house keeper wanted. He pushed a one-rupee coin under the door.the public house keeper went out.The traveller locked the door from inside.The keeper knocked at it. The traveller said that the door would not open without a black key. The keeper had to return the son. 9 Magic Pencil Short Story. 10 Foolish crow short story. 11 Bad Girl Short English Story. 12. Three Friends Short Story. Friends, if you like this story please do not forget share family and friends and if you like this story please comments.